Lacey Parcher sneaks out into the barn to meet Jess. Her father tells Jess don't come around here no more. He comes back to talk and gets run off again. Mrs. Parcher and Lacey come see Matt. Lacey says she killed Cyrus because he wouldn't let her marry Jess. Jess takes up with Bessie an old flame. Lacey's is being held and Ma Smalley's. 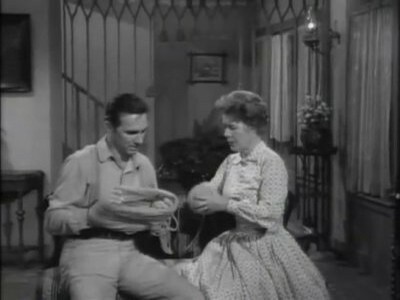 Lacey gets Ma's revolver and makes her tell about Jess and Bessie. She ties Ma up and goes after Jess. She goes up to Bessie's room, Jess is there, he tells her I had to kill your father he came at me with a pitchfork. We agreed you would take the blame, because they don't hang women. She kills Jess. Matt comes Lacey asks you never heard of them hanging a woman.